For an apartment complex, curb appeal is more than a fringe benefit - it’s a necessity. Superior Pressure Washing is your professional source for exterior cleaning services that elevate your property. If you’re a property manager, the concept of “multitasking” is familiar. You’re dealing with the needs of existing clients… But you’re also trying to attract new tenants. You’re aiming to impress with curb appeal… But you’re also trying to protect the quality of your property. We show up on time, we deliver one-stop-shop service, and we always bring professionalism to the table. Because you just shouldn’t settle for less. We use the best pressure washing and soft washing equipment to clean your property. This means that high-caliber service comes with results to match. We don’t believe that you should ever settle for service that is less than exceptional. With Superior Pressure Washing, satisfaction is always guaranteed. We don’t want to drain our clients’ bank accounts - and our rates reflect this. All of our services are priced competitively and deliver the best quality. Curb appeal starts with clean siding. Our soft washing and pressure washing solutions are a safe way to remove mold, mildew, dirt, and other imperfections from your exterior. Your first impression will shine - and new and potential tenants will be impressed. We use a soft washing solution to remove mold, mildew, algae, and even moss from your roof. Your shingles will look better, they’ll last longer, and they’ll deliver the best quality to your apartment complex. Dirty gutters don’t exactly tie a bow on curb appeal. Our cleaning service strips away the black striping to reveal a bright, clean, and beautiful aesthetic for your gutter system. Our water-fed pole cleaning system is the most effective way to clean all of your windows up to three stories tall - and our technicians can remain safely on the ground during the entire process! From breezeway cleaning to pool deck cleaning, we cover it all. For an existing or prospective tenant, every part of your property counts. We deliver the best with our full-service pressure washing solutions. 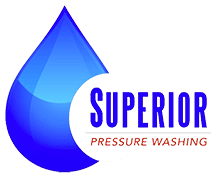 With a professional apartment complex cleaning service from Superior Pressure Washing, you’re getting a comprehensive solution for your property. Meet a simple solution - and an amazing result!